I'm Rebecca, the face behind Blue Radish. 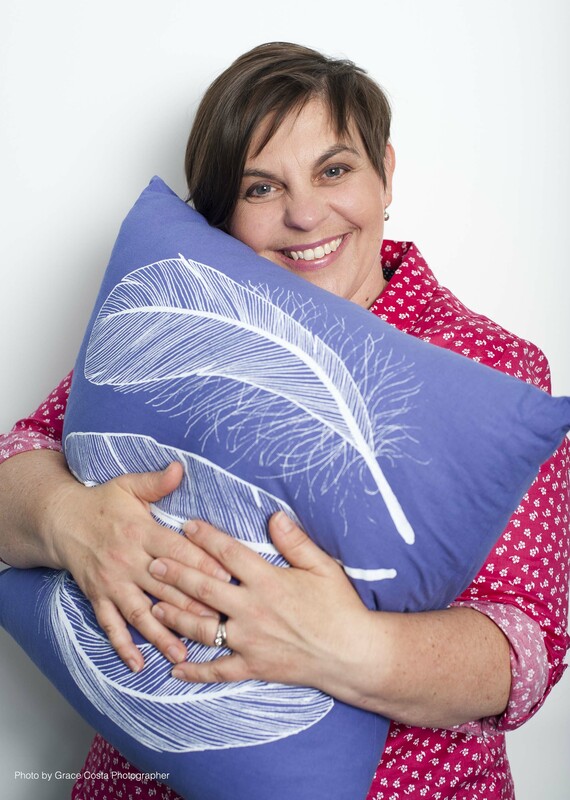 I'm also an artist, designer, printer, maker, business owner plus wife and mother to three in Canberra, Australia. And I think of myself as a creativity enabler. I believe that creativity has the power to improve wellbeing and I believe that everyone is creative. Through Blue Radish I want to encourage, support and even teach you to be creative. I'd love for you to find joy in being creative, just as I do. In my blog you will find tutorials for creative projects. You'll find musings on creativity and the link between creativity and wellbeing. You'll find behind-the-scenes looks at my own creative process and dabbling in all sorts of media. And, if you happen to be in the Canberra area, you might like to join one of my in-person workshops. I hope you will! Blue Radish was born in 2008 from the marriage of my interest in sewing and my new love, screenprinting. But my creativity journey goes way back to my childhood when I loved to do anything arty or crafty. My dear mum and nanna taught me how to sew. Nanna even bought me my first sewing machine for my 21st birthday. I did art at school and have tried soooo many media over the years. In 2008 I was looking for an evening course to do and discovered the wonderful Megalo Print Studio here in Canberra. I enrolled in a screenprinting on fabric course, returning to a medium I had loved in high school. It was from there that Blue Radish grew. It began as a kind of sanity saviour in my years as a stay-at-home mum. I would sew things, particularly bags at that point, from the fabric I printed. But I ran out of friends and family to give my creations to! So I started to sell them. When I finally returned to paid employment, I realised that my most important values, of family, freedom and creativity, were being seriously challenged by the change in circumstances so, in 2015, I took the plunge and resigned to run Blue Radish full-time. For four years I have sold my screenprinted creations online, at the Trove Canberra Cooperative and at markets here in Canberra. In 2019 I decided on another change of pace and a change of focus for Blue Radish. Through teaching some screenprinting workshops at Trove Canberra, I discovered that sharing creativity with others is a real passion. It has led me down the path of closing my online shops and concentrating on being a 'creativity enabler'. And, if you have products of a creative passion that you'd like to sell, I'd love to help you with that too. So please pop over and read my blog. And stay in touch! Connect with me on social media (all my links are at the bottom of the page) and sign up to my newsletter which will share new blog posts and, hopefully, inspiration and encouragement every month.